Our range of products include paper ropes for paper bag. Our paper ropes are widely used by Paper Bag Manufactures Our Paper Ropes are available in a wide variety of colors. Our Paper Ropes are widely used in Bag Handles. Colored Paper Ropes available in a large range of Colors. We manufacture White Kraft Paper and Brown Kraft Paper Ropes. Our Paper ropes are widely used in Paper bag handles. 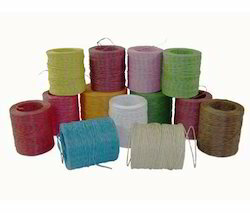 We manufacture Paper Ropes in a variety of Colors. Paper Ropes made from Paper, suitable for use as bag handles. Twisted Paper Ropes available in a wide variety of shades of colors. Twisted Paper Ropes are also available in Multicolor Options. Twisted Paper Ropes are widely used by Bag Manufacturers as well as for Scrapbooking. We are supplying Paper Ropes in 2 mm and 2.5 mm. Looking for Paper Ropes ?